The Ledge Village is series of 3D buildings and accessories that can be combined in a mix and match fashion to build tiny villages on small ledges around your home. The buildings are thin, with all detail on the front so they fit on small trim ledges. A growing number of files for Ledge Village can be found at 3dcut.com here. This tutorial is for the Mansard House. I am adding this to Ledge Village in 2017. I have always loved various styles of homes and am working my way through different variations. This is a classic two story home with a mansard roof including a widow's walk on the roof. I included the classic bay window found on so many mansard style homes. Note: Ledge Village cutting files are available here on this website and individually at the Silhouette online store. The Silhouette Store does not provide an option for group purchases but you can purchase the entire village as a grouped file here for a better price. Card Stock. I especially like the Neenah Premium Card Stock 65 lb available at Amazon. Main building grouped with bay window and roof - (file 1) 7.3268" w x 9.665" h.
Notes on part sizes: Some with different cutting machines and software combos might have size consistency issues on import. I have grouped this house as two files. If you keep the parts grouped together and resize the groups to match the above numbers the parts should all fit together. 1. Download the cutting files for your cutting machine from 3Dcuts.com here. Each piece will fit on 8.5 x 11" card stock. You will need to cut and paste the pieces to different pages to cut. I cut the main house plus the bay window and roof from one piece of card stock and all the other pieces from another. They come arranged this way. Paper colors are your preference. I like the simplicity of the all white but others have used a variety of card stock with great results. The file is grouped together. You can ungroup it in order to cut various parts from different papers. The windows and smaller details (like the picket fence) require you to understand how your cutting machine and blade best cut details. I find working with a good blade and mat and my Silhouette cut settings set on Card stock with a blade of 3, a speed of 4 and a thickness of 24 works nicely.I especially like the Premium blade for detail work. Below is a diagram of all the pieces and the terms I will use in this tutorial for assembly. 5. Fold the house front. Fold and crease all the dotted lines on the main house piece toward the back, except the horizontal lip above the door. That gets folded back on the first fold and then the opposite direction on the last fold as shown in the image. Be sure to fold the door in as well. This hard to do later. 6. Add Scor-Tape adhesive to the main tabs on the house as shown in the photo. Leave the backing in place. Over the years I have used many different adhesives for making the Ledge Village Houses. I have found that Scor-Tape holds best on 3D projects. I also like that I can remove the backing as needed which helps in assembly. This is the first tutorial where I have adjusted the color of the Scor-Tape in post photo processes to help you in identifying locations. Scor-Tape isn't pink in real life. I like to apply all the Scor-Tape to a piece while it is still flat and then peel the backing from various pieces as I assemble the house. Scor-Tape gets applied to the FRONT side of the main house on all four of the little tabs plus the long end tab. All are shown in pink in the photo. LEAVE THE BACKING ON the Scor-Tape. As you apply the Scor-Tape be sure to press it down well. Extra effort spent pressing in place will help to the longevity of the adhesive. Turn the main building over and also apply Scor-Tape to the two locations shown in pink in the image. Peel the backing off the Scor-Tape on the 4 small tabs and fold those in, adhering them to the adjacent sides. I find it helps to use needle-nose tweezers to peel the backing off of small pieces of Scor-Tape. All 4 corners are square corners and this will form the front of the box shape of the first floor of the house. 7. Add the bay window. Fold and crease the bay window on all dotted fold lines. Look carefully to be sure you get them all. All folds go towards the back EXCEPT the two side tabs. Those fold toward the front as shown. Apply Scor-Tape to all tabs as highlighted in pink. The sides and top tabs get the Scor-Tape on the front. The 3 bottom tabs get the Scor-Tape applied on the back side. Leave the backing in place. Peel the backing from the Scor-Tape on one side of the bay window and slide that into the bay window hole from the front of the house. The tab gets adhered to the backside of the house as shown below left. Alignment of the side seams is important so make sure it is properly placed right up against the edge before pressing in place. Next, form the top of the bay window. This area does get covered by the roof in a future step. First peel the backing from the Scor-Tape on the two sides of the middle roof of the bay window. The side triangle roof pieces get adhered to those. Next, fold the three remaining tiny tabs down behind the bay window roof. Use tweezers to pull the Backing off. Press the center to the wall in place first working to center it over the bay window. Press the two side triangles in place. You can use tweezers from the inside to really press these seams to adhere. Fold the bay window roof piece on the 2 dotted fold lines. Notice one side of the middle portion is shorter. That side is put next to the building. The wider side is forward. Apply a piece of Scor-Tape to the back of the bay window roof and adhere it in place. Watch to make sure it is both centered and level. Peel the backing tape from tab for the side seam of the house and adhere in place being careful to keep the building square. The dotted fold line should line up perfectly with the edge of the back piece. Slide a long skinny tool like a letter opener inside to help press in place. Using tweezers, pull the backing tape from the lip tab and press in place. This is square with the back. Pull the three tabs on the bottom of the bay window forward and out of the way. Peel the backing tape from the bottom tab and fold over, adhering it in place. Peel the backing from the three tabs on the bottom of the bay window. Wrap the center tab around to the bottom, make sure it is centered and then press in place. Press the two side tabs in place. 10. Add the Mansard roof with dormers. Select the mansard roof base piece and fold toward the back on all fold lines. Apply Scor-Tape to the front of the two tiny tabs on each end, and to the base. Notice placement on the base it is near the back tab. On the back-side apply Scor-Tape to the two side tabs and the top tab. Leave the backing on all Scor-Tape. Peel the backing from the Scor-Tape on the two tiny side tabs and adhere them to the inside of the base forming the corners. Press to hold. Peel the backing from the Scorr-Tape on the long upper tab. This tab will be adhered to the back of the top roof line of the house. Carefully center it and match the roof line with the dotted fold line. Press in place and fold the roof down in front of the house back. Peel the backing from the Scor-Tape on the bottom of the roof piece, Slide the roof into place over the first floor and adhere. Use the letter opener to slide in and press together. Peel the Scor-Tape backing from the two side tabs. Wrap those around to the back of the house and press in place. There are two dormers and both have many tiny dotted fold lines. The inner set that border the window frame all fold to the back. There are four of those. There are three tiny tabs to shape the peak of the roof. They get folded back. The next set which are the support tabs all get folder forward. There are five of those, one at the bottom of the window, two on the sides, and two on the roof. Do this on both dormers. Apply Scor-Tape to the front side of all 8 tabs. I used a mixture of 1/8" and 1/4". First, peel the backing on the peak tab and form the peak of the dormer. Next peel the two tabs on the side of the peak, and press those in place attaching the dormer roof to its sides. Before peeling the remaining backing, place the dormer in the roofing opening from the back to understand the fit. It is snug but fits well. Peel the backing off all 5 tabs and place the dormer in the window. The tabs get glued to the inside of the roof cover. Repeat for the second dormer. 12. Add the outer roof cover with dormers to the building. Fold along the fold lines on the roof cover. These fold go towards the back. Apply one strip to the roof base below the empty openings of the dormer windows. Apply a strip to the top tab on the back side of the roof cover. Apply strips to both side tabs of the roof cover on the back side. Peel the top tab backing strip and position it behind the roof working to center it and keep it level. Peel the strip on the bottom of base and flip the roof down and into place. Peel the two side strips and fold the sides back and adhere in place. Use a strip of Scor-Tape to adhere the chimney and widow's walk to the back of the roof extending above. Apply Scor-Tape to the underside of each dormer roof and adhere those in place. The slanted edge goes toward the roof. Fold back all the little tabs on the door roof and apply Scor-Tape to the 3 tabs. Adhere over the door working to keep it centered and level. Congratulations! you have completed the Mansard House from the Ledge Village Collection designed by Marji Roy of 3DCuts. The collection includes a growing number of buildings and accessories. Have fun making them all. In the photos for this display I added battery operated fairy lights (from Amazon) to the buildings. I simply poked a small hole in the back using an x-acto blade and inserted the tiny light. The file does come with a tree. Go here for the tutorial on tree assembly. 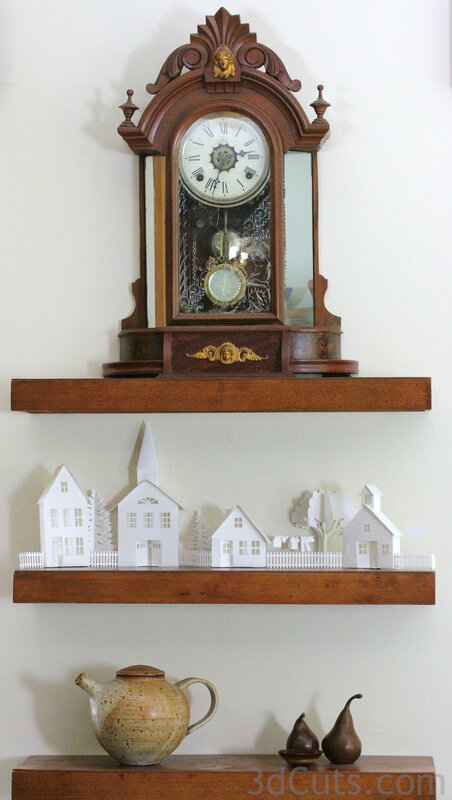 Share your villages on Facebook or by emailing photos to me at marji@3dcuts.com. I share different arrangements on my idea page here.